Every meal looks great! And I won’t lie to you. I’m blog shallow. If I like the font and pictures someone uses on their blog, I’m much more likely to continue looking at other recipes. Yes, I realize this is ridiculous. But I like pretty fonts. Anyway, the healthy recipe for me to make was Asian Turkey Meatballs with Lime Dipping Sauce. The first time I made a recipe with ground turkey…well, I don’t know what went wrong but it was absolutely disgusting. Since then, I’d been afraid to just use ground turkey so I added some ground beef to this, hence the slight title change. 1. Preheat the oven to broil. Spray a large baking sheet with non-stick cooking spray. 2. In a small bowl, whisk together the soy sauce, lime juice, water and sesame oil for the dipping sauce. Add the green onions and refrigerate until ready to use. 3. In a medium bowl, combine all of the ingredients for the meatballs. Form into meatballs and place onto the baking sheet. 4. Place in the oven and cook for 15 minutes. 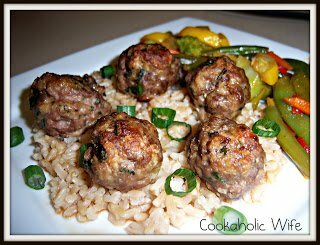 Serve the meatballs with the dipping sauce drizzled over them. I served this with steamed brown rice cooked in half water, half low-sodium chicken broth along with a bag of frozen stir fry veggies mixed with 1 tablespoon of stir-fry sauce. The entire meal came out to under 450 calories and was really good! I definitely plan on making this again in the near future!